Classical mind map consists of the single Main Idea surrounded by related ideas and branches, deepening the main theme. The Multiple Main Idea on a single mind map page is really useful when you have a lot of corresponding ideas. 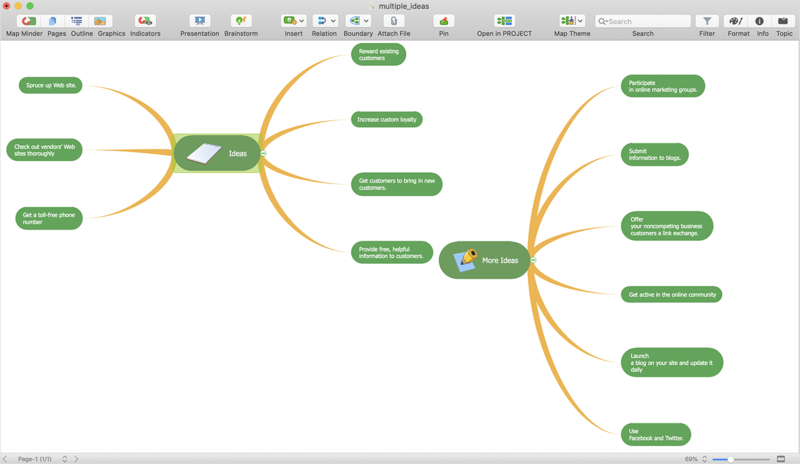 ConceptDraw MINDMAP allows you to insert a number of different mind maps onto a single workspace. The Multiple Main Idea on a single mind map page is really useful when you have a lot of corresponding ideas. Access the context menu by right clicking your mouse on an empty area of your mind map. Select Insert Topic → Main Idea. Use Ctrl+Enter (Windows) or Cmd+Enter (Macintosh) to add the next level of topics to the new Main Idea. Result: This can help you make multiple Main Ideas visually clear and easier to tailor by connecting them with branch lines or relationships. More than 900 clip art images and 200 Quick Symbols.